You'll be impressed as to how well microfiber cloths and microfiber mops work and how easy they make most cleaning jobs. To keep your cloths and mops working for years to come please read our friendly guide below on proper care instructions for microfiber products. For your microfiber to be most effective at cleaning, do not use liquid fabric softener or dryer sheets when laundering. To help your microfiber last longer, do not use bleach in the washing machine. Avoid clogging microfiber pores by washing microfiber separate from cotton. Jeans and other clothes that are sturdy and don’t shed are okay to mix in your microfiber load. Always protect your microfiber by drying it on low heat for a short time or hang dry. Cold or warm water is sufficient but for heavily soiled microfiber, hot water can help the pores expand and eject dirt. Any detergent is safe for microfiber but clean rinsing detergent is better than powder detergent. We use Micro-Restore in the washing machine to degrease and restore microfiber. After dusting, shake microfiber outside or hand rinse and continue to use until heavily soiled. Drying any microfiber should be done on a low tumble dry or cool setting. Drying on warm or hot or over drying microfiber will cause shrinkage or damage the material. Microfiber is the most effective material for cleaning small particles and germs. The tiny fibers grab fine particles like dust, dirt and pet dander & hold them until submerged in water. For your health and the health of your microfiber, avoid using bleach in your cleaning solution. Ammonia, bleach and other chemicals can be used but are not healthy for people or pets. We recommend water or eco-friendly all purpose solutions for cleaning. Use the correct weave for your purpose, i.e. waffle weave for drying cars or dishes/glasses. Use the correct microfiber mop pad for floors, windows/mirrors. Use dry dust pads for sweeping. Rub them to get a static charge. Use wet scrub pads for deep cleaning/wet mopping. Combo mop pads work well wet or dry. Use edgeless or satin edged microfiber on your collector cars. Use Chenille Wash Mitts to wash and dry pets. Bath Sheets and Towels are the softest towels made and are perfect for folks with sensitive skin. Pat dry but don't scrub sensitive skin with microfiber. Use microfiber glass towels or grout pads for glass, mirrors and windows. Use microfiber flat mops for everything ranging from washing RV's to spreading concrete. What is the best way to clean or wash Microfiber products? Hand or machine wash in hot or warm water, with detergent. Washing at a high temperature makes the microfibers expand, releasing trapped dirt and micro particles. Do not wash cloths or mop pads with terry towels or other materials that "shed" a lot of lint. Wash them separately or throw them in the wash with jeans or t-shirts (articles that don't shed a lot of lint). Drying pads should be done on cool or hung to dry to prevent shrinking. Drying on warm or hot or over drying these pads will cause shrinkage or damage the pad. WARNING: Over a period of time, harsh chemicals, such as those contained in bleach and fabric softeners, will decrease the effectiveness and durability of the microfiber material. Although our products only require water to clean and even kill germs and bacteria, chemical cleansers can be used without damaging microfiber materials. Do not iron. What are some of the uses for Microfiber I haven't thought of? Try the Microfiber towels around the house for dusting, mirrors, the shower or tub: in the car, RV or Boat. Dampen just with water to take many stains out of carpets or even clothes. Use dry to dust or clean your computer. Towels will remove loose hair from pets and are also great for drying them. And speaking of pets, better try our mop for picking up pet hair from floors. Just be creative with your Microfiber products. You will be amazed and thrilled at how well they work and how easy they make many jobs. What should I do if the product I received doesn't meet my expectations? All of our shipments are inspected before they are shipped, but if the products you receive do not meet your expectations, send them back to us for a full refund of your purchase price. This does not include shipping and handling. Products must be returned within 30 days for a full refund. Is there a way to get faster shipping? Yes, your order can be expedited, but it will cost more. Just let us know. Sales Tax is added only for customers in CThe rate is 8%. USPS 1st. Class, USPS Priority Mail and UPS options. With standard shipping procedures, how long will it take for my package to ship from your warehouse? Approximately 1-2 business days for standard orders unless otherwise noted. Can I pay for specialty shipping? Yes, if the product is in stock we can overnight, 2nd day, or 3rd day your product. You can return any product for any reason with its original packaging, in near new or new condition within 30 days of its receipt and receive a refund of the product price. All returned products must be accompanied by the original packing slip. What about a used product? We will be happy to accept returns of used products as long as management issues a RMA for the items in being considered for the return. We have the right to refuse any used return at any time. Addresses No Warranty for any Remote Control items that have been used or taken out of the box entirely. Remote Control items have a 3 day D.O.warranty. We will pay shipping charges if it is D.O. Customer is responsible for shipping back for full inspection before we offer a refund or exchange. 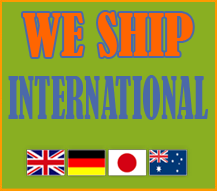 If the item has been used or deemed damaged we can send it back to you with the shipping fees handled by the customer.